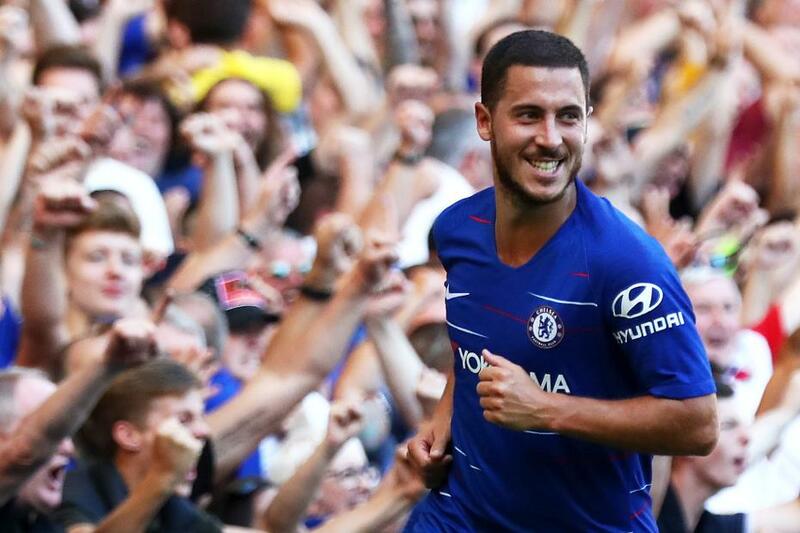 Eden Hazard's (£10.6m) outstanding start to the Fantasy Premier League season continues to gather momentum. The winger fired Chelsea's second goal in a 2-0 home win over AFC Bournemouth to claim 11 points in Gameweek 4. He now sits in joint-fourth place with Mohamed Salah (£13.0m) in the midfield standings, on 27 points. Hazard has two goals and two assists in four appearances under new head coach Maurizio Sarri. And that's despite not starting until Gameweek 3 following his exertions for Belgium in the 2018 FIFA World Cup. Hazard is the only midfielder to produce a goal or an assist in each of the opening four Gameweeks. The Blues' wide man has recorded 10 shots and 10 chances created in only 223 minutes of action. Along with Salah, with 19 shots and 13 chances created, Hazard is one of only two midfielders to produce double figures in both those categories. But while Salah is owned by 53 per cent of squads, only 17.4 per cent have Hazard. Compared with last season, the Chelsea No 10's attacking potential is on the rise. His minutes per shot has improved from 34.3 to 22.3, while his minutes per chance created is up from 29 to 22.3. He also has the schedule to maintain his early output. Chelsea face Cardiff City, West Ham United and Southampton in the next four Gameweeks. This suggests that Hazard can continue delivering goals and assists and possibly even challenge Salah as the go-to premium midfielder for 2018/19. Tom (@WGTA_FPL): "The issue with Eden is that, unless you're Wildcarding, your side may require a bit of surgery to buy in. Five minutes off a blank v Bournemouth, and Alonso covering Chelsea front and back anyway makes me question if I want to rejig to the tune of a hit for my arch-troll... probably not. But it's your call!" Simon March (@MarchSimon): "Hazard is typically a steady rather than explosive scorer but his partnership with Alonso on Chelsea's left flank looks like it could deliver points for both players all season. I'd bring him in on a Wildcard but, otherwise, I'm not sure he warrants major surgery just yet." Lee Bonfield (@FPLFamily): "Hazard's a world-class player, no doubt, but also has a record for inconsistency. Let's not forget, he was five minutes away from a blank at the weekend. I personally believe Pedro and Alonso are the Chelsea players to own." Jay Egersdorff (@JEgersdorff): "I Wildcarded ahead of GW4 and was faced with the dilemma of Hazard/Alexander-Arnold/Dale Stephens v Walcott/Mkhitaryan/Neves. Sadly in GW4 I wasn't rewarded but the dilemma here is whether Hazard's points can outrun a star defender plus two credible top-six midfielders."